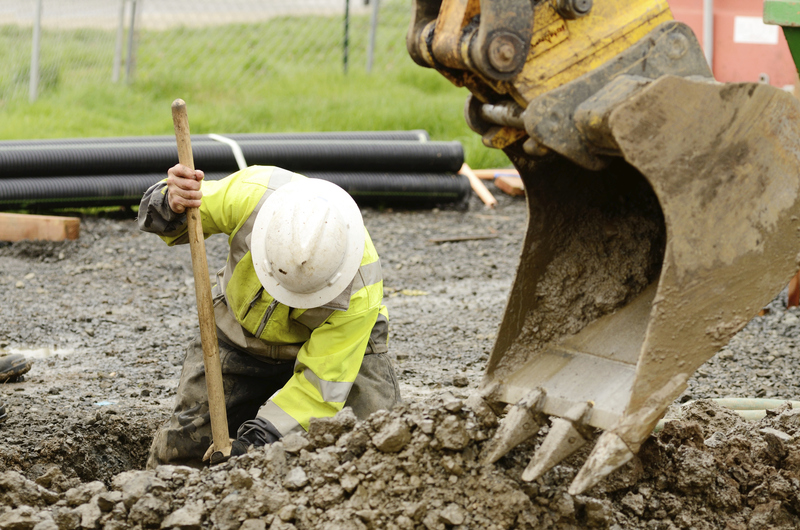 No matter how minimal a project may seem, contractors who plan to dig or excavate are required to call 8-1-1 and, at least two days beforehand, coordinate with either the Underground Service Alert of Northern California (known as USA North) or Underground Service Alert of Southern California (aka DigAlert). You must call 8-1-1 at least two working days, but not more than 14 days, before starting your dig. You are not allowed to dig during that time. You will be given a ticket number that references your dig information. Each contractor must have his or her own number. Sharing a ticket among contractors on a single job is not allowed. Tickets are valid for up to 28 days after they're issued. Once the call is made, accurately outline your excavation area. Utility company representatives will visit within two working days either to mark or stake the horizontal path of their underground lines, provide information about the location, or advise whether there are lines in conflict with your project. Hand excavation may be required when digging around underground facilities. Senate Bill 119, currently on the Governor's desk, will, if signed into law, significantly increase CSLB's excavation oversight and enforcement. General contractors, particularly those who work in earthquake-vulnerable parts of the state, are invited to attend a free training session intended at helping homeowners evaluate the seismic safety of their homes. Classes on how to use FEMA's Simplified Seismic Assessment form are being offered in Riverside, Norwalk, and Sacramento in October. The training is sponsored by the California Earthquake Authority, Governor's Office of Emergency Services, FEMA, Simpson Strong-Tie, and ATC. The FEMA P-50 form assigns a Seismic Performance Grade for detached single-family, wood-framed homes for their quake readiness. Professionals such as general contractors, structural engineers, home inspectors, building officials, and emergency management specialists can perform the evaluations, and provide homeowners with the Seismic Performance Grade that identifies areas of the home in need of retrofit. The class is free, but those interested must sign up. All sessions are from 9 a.m. to 3:30 p.m., with lunch provided. Those who participate will get six Continuing Education Units. October 8 – Riverside: Simpson Strong-Tie, 12246 Holly Street, Riverside, CA., 92509. October 20 – Sacramento: Cal OES, 10390 Peter A. McCuen Blvd., California Room, Mather, CA.,95655.